NEW YORK, Mar 6, 2012/ — Fine jewelry company, Carelle is holding a sweepstakes, Lotto style on Facebook where they will be giving away three different pieces from their Heart and Key collection, ranging from $145 to $1,740. As in a Lotto, the more entries received, the more valuable the prize. 1,000 entries or more, Carelle will give away a sterling silver Heart and Key pendant. 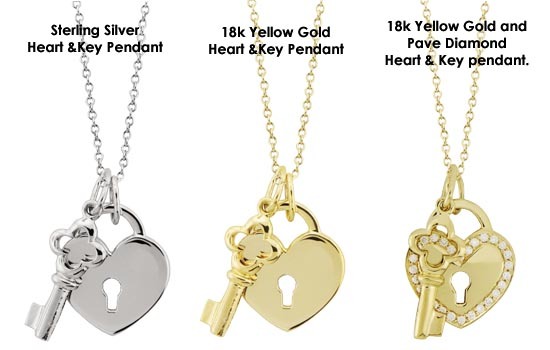 3,000 entries or more, Carelle will give away an 18k yellow gold Heart and Key pendant. 7,500 entries or more, Carelle will give away an 18k yellow gold and pave diamond Heart and Key pendant. Like Carelle on Facebook, then enter to for a chance to win one of these prizes. Carelle is known for their meticulously handcrafted 18k yellow, rose, and white gold pieces, which are made in New York.